All art is propaganda - religious art, political art. The only difference is the kind of propaganda. Since art is essential for human life it can't just belong to the few. Art is the universal language and it belongs to all mankind. the photo above is one of four diego rivera murals that adorn various walls throughout the san francisco bay area. this one is located at the san francisco art institute and entitled making a fresco (or the making of a fresco showing the building of a city). the mural plays with the viewer with its utilization of a trompe l’oeil wood scaffold and how it features a fresco inside a fresco. rivera has place himself in the center of the mural, with his back to the viewer. a complete description of the mural can be found here. rivera is known primarily as a muralist, but like most artists he was quite versatile. during the late 1930s and 1940s diego was drawn to portraiture, as with all of his work he often depicted the indigenous peoples of mexico. 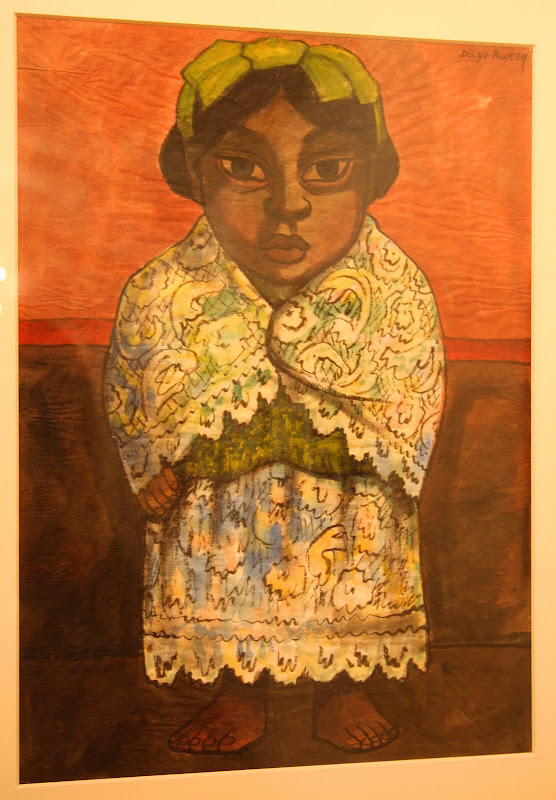 the photo above is of a watercolor entitled portrait of a girl it was done in the mid 1940s and is currently on view at the allen memorial art museum (amam) in oberlin as part of its exhibit out of line: drawings from the allen from the twentieth century and beyond. pardon the odd angle of the photo, sometimes it's difficult to take photos of art hanging on gallery walls, particularly when glass and overhead lights are involved. by the way, the allen will be closing on december 23rd for several months while the museum undergoes some significant renovations. el gusto, as performed by los camperos de valles at the 2005 smithsonian folklife festival. the song was used in the soundtrack for the 2002 movie frida. in the movie alfred molino was to diego rivera as salma hayek was to frida kahlo. in my humble opinion, both actors did an amazing job channeling the charisma and passionate nature of the two artists - if you haven't seen the movie, it's your loss; but a loss, I expect can be easily remedied. come to represent the best in one of Mexico's most distinctive and uplifting folk music traditions—the son huasteco. In the son huasteco tradition, poetic lyrics often deal with themes of longing, love, and nature. The melancholy themes often contrast with and yet somehow complement the playful melodies. "El gusto" (The Pleasure) is about lost love and typifies how imagery of rural life is often used to portray this pain and longing in son huasteco. gorgeous Rivera mural. Con gusto, indeed. cheers on the run from Graulhet. The post and pictures entertained me whilst the kettle was boiling, the video entertained me whilst I had my afternoon tea. If you click on the Salut! link in my blogroll on the right you'll get Colin's blog and The Frog Queen's response. Propaganda, shmopaganda; only Rivera could do a mural like that! I almost fell into that one,I did! What wonderful music! Love the violin player hitting those falsetto notes. I've always loved Diego Rivera's murals. Thanks for letting us know today's his birthday. Oh, and about your tree picture on Dec. 1 - I'm not really as good with trees as I am with birds. I would tentatively ID it as a Possumhaw, a deciduous member of the Holly family, but don't quote me. The bark looks right, and the berries are basically the same, but all the Possumhaw berries I've looked at online (I love Google Images) are more orangey than yours, and yours have a vague transparency the the other pictures I've looked at don't have. But of all the trees with red berries listed in my field guide, your tree best matches the Possumhaw in structure and bark. But as I said, I'm no expert, so don't quote me on it! With regard to your comment to me in the previous post, I watched the documentary of Pollan's book earlier and I'm researching local options for food here. I will read the book as time allows, and check on Pollan's other projects. Thanks! I haven't had the opportunity to see a lot of Diego's work, I did see, however, a Frida Kahlo exhibit at the Philly Museum of Art and her relationship with him was described as it informed much of her art. Now, of course, I must learn more about Diego. Oh, and I saw Frida and quite enjoyed it. I totally loved that movie! And you are right both were wonderful. When you are back and have time lets scrabble!